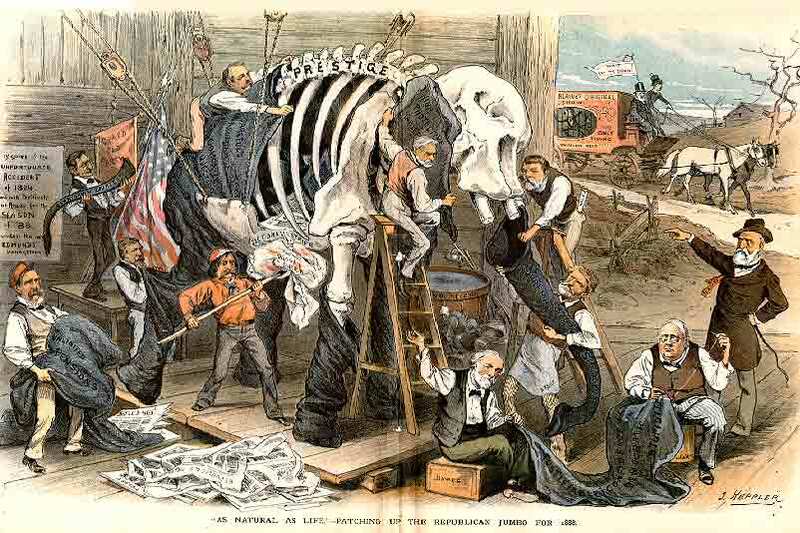 After their defeat in 1884, the Republicans are shown here, in 1886, planning what would became their successful strategies for the 1888 election, despite Keppler's satiric disapproval. One man is stuffing the belly of the elephant with 'bloody shirts,' metaphoric allusions made literal in this illustration to represent sectional strife. 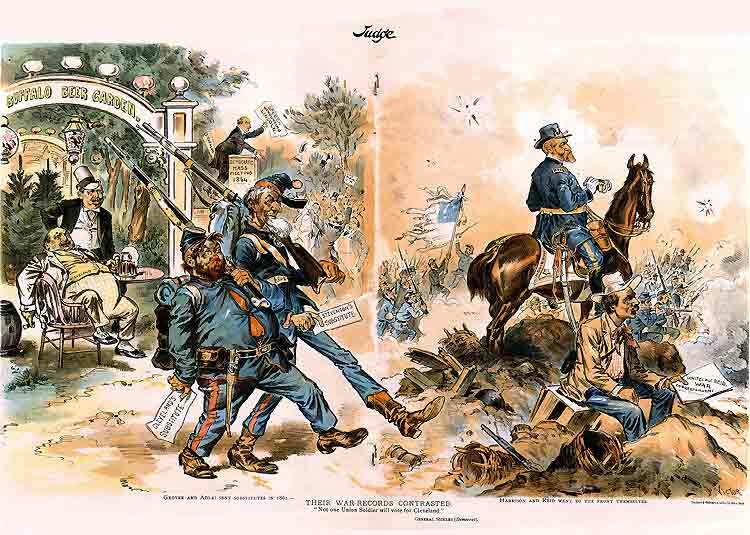 'Waving the bloody shirt' was a Republican rallying cry to remind voters of the Southern secession and the civil war that had followed in its wake. The 1888 election saw the defeat of Cleveland by Republican moderate Benjamin Harrison, who was the grandson of another president, William Henry Harrison (a War of 1812 hero, elected in 1840 who died after one month in office). Keppler used an overly large hat to symbolized Benjamin Harrison as a pale imitation of his heroic 'Indian fighter' grandfather. In the 1890 mid-term elections, the Democrats gained control of the House of Representatives. 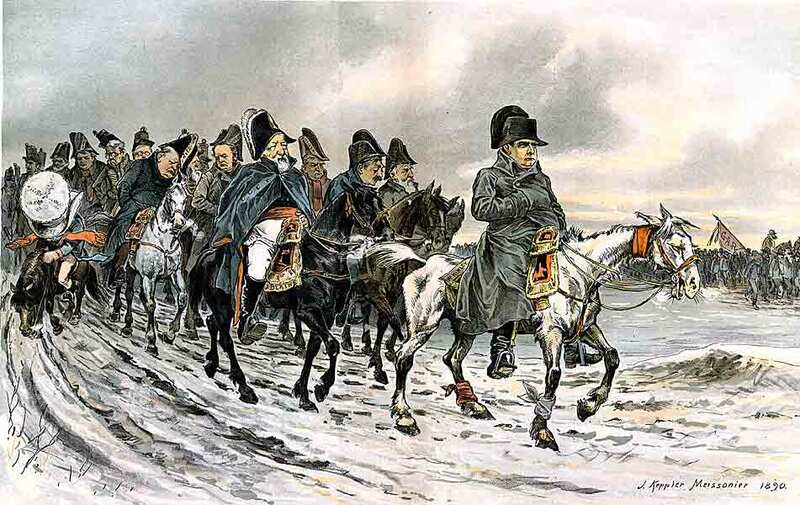 Keppler 'borrows' a well-known 1864 painting by Jean-Louis-Ernest Meissonier, [Campagne de France, 1814] depicting Napoleon's retreat from Russia, to indicate the mood of the Republicans, now a political minority in Congress. 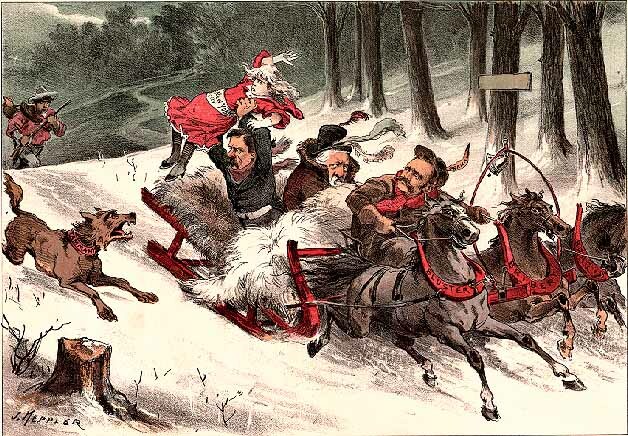 Harrison is riding a pony on the far left of the illustration. He is plodding toward eventual political defeat in the 1892 election, his small body almost completely hidden by his overly large hat. 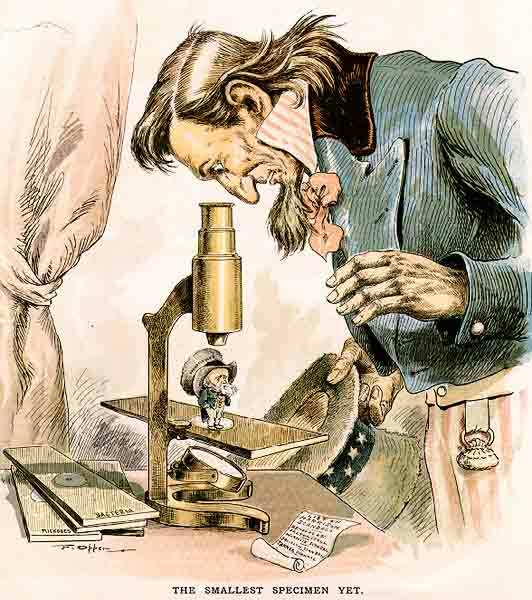 The hat-too-large-for-the-body image was used repeatedly by Keppler and other Puck artists, including Frederick Opper, who put the ever shrinking Harrison under a microscope in another 1890 illustration. Part of what fueled a growing public discontent during Harrison's term was the passage of the McKinley Tariff Act (a tax on imported items) in 1890. High tariffs tended to protect large industry from foreign competition, while keeping prices high for those who could least afford it: small farmers, small businesses, and wage earners. In 1892, Democrat Grover Cleveland, and his running mate, Adlai E. Stevenson, defeated Republican incumbent Harrison, and his running mate, journalist Whitelaw Reid. [The view of all four candidates in terms of their Civil War records by Judge artist Victor Gillam was in complete contrast to the view taken by Keppler]. But by 1896, business interests supporting the Republican Party ensured the presidential victory of William McKinley, the former senator who introduced the tariff bill that took his name in 1890. He defeated William Jennings Bryan, the Populist Democratic candidate. In this image, Keppler and Opper graphically warns of the evils of protectionism, high tariffs and easy credit, all of which were favored by big business. 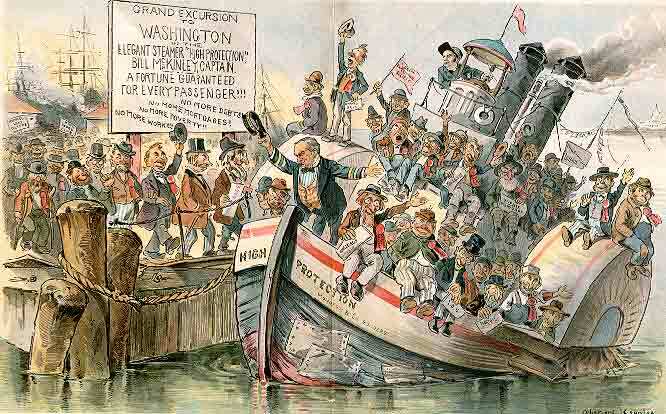 The patched and dangerously listing boat, piloted by Senator Mark Hanna, is overloaded with supporters who wave their unpaid mortgage papers as McKinley promises prosperity for all. [See Opper's Willie and His Papa for a description of McKinley's successful bid for a second term, the 1900 election campaign, also promoted by Hanna].